Owners of Borinka cottage would like to invite you to spend a pleasant holiday in central Slovakia, 20 km from the central point of Europe. Borinka cottage is hidden in a beautiful untouched nature of Kremnické vrchy (Kremnica hills), 800 m above sea level. 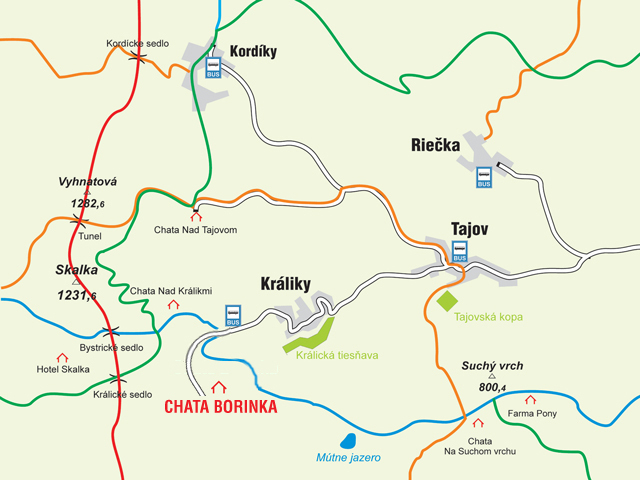 It is 12 km far from the city Banská Bystrica and 2 km from the village Králiky. In winter there is a great choice of tracks for cross-country skiing and several ski lifts for downhill skiing. Good skiing conditions last up to spring months.